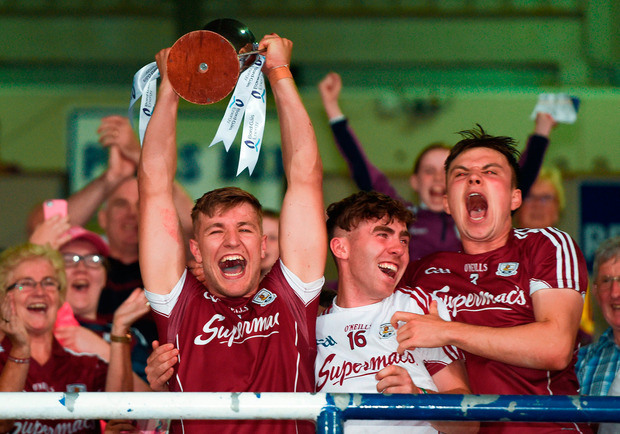 Sean Bleahene was brought back on in extra-time and he proved to be Galway’s hero as his late goal saw the Tribesmen claim the Leinster U-21 hurling title at the first attempt. Galway were denied victory in the closing stages of regular time at O’Moore Park when Wexford wing-back Ian Carthy forced extra-time with a late goal. But just when it seemed Wexford were poised to claim their 18th Leinster crown in Portlaoise, Galway produced one final rally and Bleahene returned to blast home the winner. Early on it seemed Galway were going to coast to victory when they led by six points after just 12 minutes but managed just one more point from there to the interval. The goal came from Tomás Monaghan after a good run and the match opened at a frenetic pace which saw Galway lead by 0-6 to 0-3 after just seven minutes. Seamus Casey and senior player Rory O’Connor hit good scores for Wexford and before Cianan Fahy grabbed his second for Galway to see them lead by 1-8 to 0-6 after 16 minutes. Wexford then took charge and struck seven points without reply with Casey and O’Connor leading the way and it took a superb double save from goalkeeper Eanna Murphy to deny Liam Stafford and Rory Higgins a goal after 19 minutes. Evan Niland pulled back a point for Galway after the restart but Wexford hit the next three from Joe O’Connor, Stephen O’Gorman and Rory O’Connor and would have been further ahead had Galway goalkeeper Murphy not saved a penalty from Casey. Galway rallied with a couple of frees from Niland and a good effort from Monaghan but then Casey soloed through and blasted to the net to help Wexford lead by 1-17 to 1-12 going into the final quarter. But then Galway got hope when Cooney scored a goal from an acute angle after 47 minutes and inside a minute Niland flicked home their third goal and Cooney pointed to suddenly put them ahead by 3-13 to 1-17. Galway lost corner-back Shane Bannon to a second yellow card but managed to push the lead out to three and looked set for victory but Carthy rescued Wexford at the death. Wexford held an edge in extra-time and a sixth point of the game from senior player O’Connor looked to have secured the win but there was still time for Bleahene to win it. 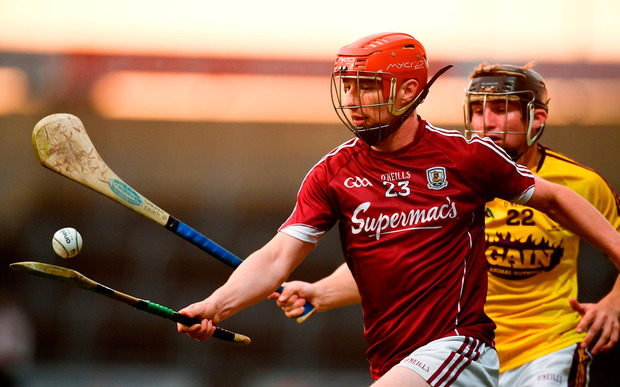 Scorers – Galway: E Niland 1-7 (7f); T Monaghan 1-2; K Cooney 1-2; C Fahy 0-5 (1’65, 1f); S Bleahene 1-0; B Concannon 0-2; S Loftus 0-1, F Burke 0-1, C Caulfield 0-1. Wexford: S Casey 1-11 (9f); R O’Connor 0-7 (2f); I Carthy 1-0; S O’Gorman 0-2, J O’Connor 0-2, R White 0-2; G Molloy 0-1, R Higgins 0-1. Galway – E Murphy; I O’Shea, J Fitzpatrick, S Bannon; J Grealish, F Burke (c), M Hughes; T Monaghan, S Loftus; B Concannon, C Salmon, C Fahy; E Niland, S Bleahene, K Cooney. Subs: P Foley for Salmon (h-t), C Caulfield for Hughes (41), J Canning for Bleahene (42), C Connor for Bannon (60), R Murphy for Concannon (66), M Lynch for Monaghan (75), S Bleahene for Niland (77). 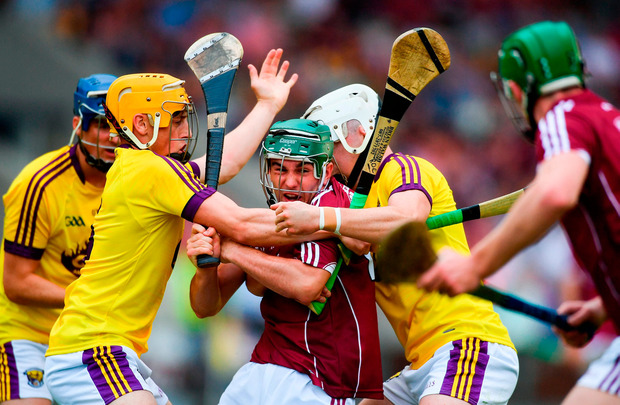 Wexford – J Cushe; S Reck, D Byrne, I Carthy; A Maddock, D Reck, G Molloy; C Firman (c), R White; J O’Connor, R O’Connor, L Stafford; S O’Gorman, R Higgins, S Casey. Subs: M Dwyer for O’Gorman (52), O Foley in for Stafford (52), D Codd for White (56), S O’Gorman for Casey (66).